The former UKIP leader has entered the fray around the hard-hitting definition of Theresa May, the head of the Labour Party Jeremy Corbyn reportedly used during a Prime Minister's Questions session in the British Parliament. Ex-UKIP leader Nigel Farage wondered, as he was speaking on LBC radio, whether Jeremy Corbyn would be called sexist if he had said “a stupid man” in a similar row. 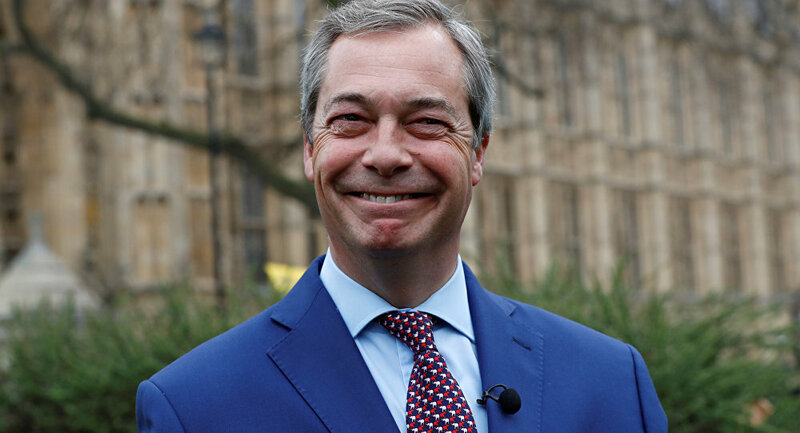 Farage claimed it seemed to him like he said “stupid woman” although many in the Labour Party have said it was “stupid people”. “Now I wonder if he’d said stupid man whether he’d have been called sexist for doing that. I think it’s a row about nothing. I have to tell you that I have muttered under my breath things probably far ruder than that when I’ve been attacked by Mr Verhofstadt or Mr Juncker in the European Parliament. My view: it’s a row about nothing” Farage concluded. His stance found support online. — Karen Saunders (@KarenFreeSpirit) 19 декабря 2018 г. — shifty boy #Bollockstoya😁 (@shifty_bateman) 19 декабря 2018 г. Calling a woman who has done stupid things is not mysoginistic lmfao. — Hot Topic (@SavetheSloths23) 19 декабря 2018 г.
Rubbish if she had called him a stupid man? There would be nothing said? All of this correctness has gone to far? It's ridiculous? — David Levesconte (@DavidLevescont1) 19 декабря 2018 г. The point is not that he called her that, a 5 year old can see he did. Corbyn is a LIAR. Plain and simple. — Steven Stanley (@StevenS08087069) 19 декабря 2018 г. — 61 (@GeordieBok) 19 декабря 2018 г. ​​Some took aim at the shallowness of this row. — Andy Gifford (@AndyGifford6) 20 декабря 2018 г. Once again… Parliament turn playground. No one should care what they think of each other, we should only be interested in what they're planning to do to save this country. As leaders go…they're nothing but an embarrassment. — Cherry Dalton Finch (@Chezzybubbs) 20 декабря 2018 г. ​Following Prime Minister's Questions in the British Parliament, Conservative MPs lambasted opposition leader Jeremy Corbyn for muttering the accusation “stupid woman” as soon as he sat down after the heated exchange. They demanded he should apologise. A spokesperson for Jeremy Corbyn stated that the opposition leader “did not call [Theresa May] a stupid woman, and so I don’t think there’s any basis for an apology”, adding that he had said “stupid people” instead. Another prominent Labour Party politician, Shadow Home Secretary Diane Abbott, slammed the matter as “a phoney row”, contrived “to distract attention from the chaos they're in after Brexit”.